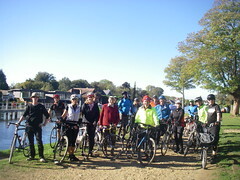 Wednesday 3rd October. 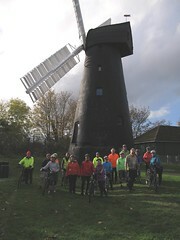 A bright largely Sunny day, saw 18 Cyclists on the inaugural KCC Midweek ride leave via Portsmouth Rd, Long Ditton, Hinchley wood, Esher, Fairmile Common, Fairmile estate, Cobham, Hatchford, Ockham, Ripley to Send Marsh for lunch at the ‘Saddlers Arms’, then Newark Lane, Pyrford, West Byfleet, Basingstoke Canal & Wey navigation Towpath’s, Brooklands Park, Weybridge, Burwood Park, to Hersham Garden centre for Refreshments, Hersham, Esher, Thames Ditton, Portsmouth Rd to Kingston. 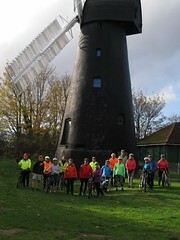 Total 33 Miles, 3 new faces, thanks to Will for back marking & many others for marking corners.